Education Resources provides educators with access to approximately 300,000 standards-aligned open educational resources and approximately 1,000 standards-aligned assessments. Enabling this feature adds a button to OneNote Class Notebook (on Windows) and that provides teachers with the ability to find and select resources to add to their OneNote notebooks. 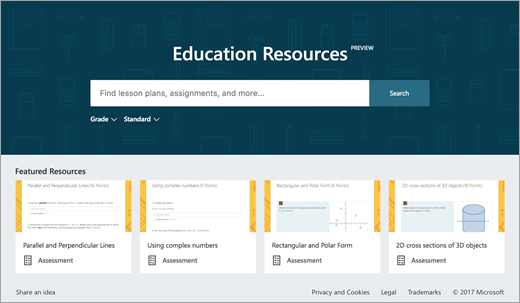 In Microsoft Forms, teachers can find and use free assessments. By using this service, you agree to these Online Services Terms. The educational resources provided are third-party websites and services and Microsoft is not responsible for the content of any linked site. Your use of these resources is subject to that third party’s terms and conditions. Is the Education Resources feature on by default? This feature is currently off by default. To turn it on, ask your IT admin to enable Education Resources in the O365 Admin Center. They'll also need to enable the Microsoft Store in order to use the feature — instructions on how to do so can be found here. How many resources are available? There are approximately 300,000 open activity resources available. We also have about 1,000 free assessments available that are managed within Microsoft Forms. What categories of resources are available? We currently provide access to resources in the following categories: Language Arts, Math, Science, Social Studies, Health and PE, World Languages, English as a Second Language, Early Childhood, Arts Education, Career Technical Education, Media & Technology, and Professional Development. Did Microsoft create these resources? Education Resources are third-party creations that are publicly available on the web. Your use of these resources is subject to that third party’s terms and conditions. Which education standards are supported? A complete list of the standards we support is available from our partner Edgate. On average, education standards change 30% year over year, and as a result we update our standards regularly with updates from the standards authorities. Where can I find Microsoft’s Privacy Statement? You can find the Microsoft Privacy Statement here. Where can I learn more about Microsoft’s copyright policies? Learn more about Microsoft's copyright policies here. How can I inform Microsoft of an issue with one or more resources? Submit any issue reports here. Which languages are the resources available in? Most resources are in English, though some are available in Spanish, French, German, and Portuguese. Contact us using the Education Resources suggestion box — we always appreciate feedback. How can I receive support with a question or issue? Navigate here for more information on how Education Resources works within your OneNote Class Notebook and herefor how it works within Microsoft Forms. For any additional inquiries, email us at edusourc@microsoft.com. We’ll get back to you as soon as possible. Can I publish my own resources into Education Resources? Once Education Resources has been enabled in the O365 Admin center, your account is then automatically enabled with the resource uploading feature. In the upload process, you'll select the applicable Creative Commons license for your material. Can I rate and review resources? What do each of the Content Types mean? A description or outline of short projects or tasks in which students participate. A piece of writing from a website, newspaper, magazine, or other publication. A set of questions for measuring a student’s comprehension of one or more concepts. Question for measuring a student's comprehension of concepts. A teaching unit that spans a term. A resource with seasonal topics or unified concepts. Educational information that can be used to supplement lesson plans or teacher guides. A student resource where the user inputs a response/answer and upon submission the correct answer is revealed. An online game or activity that allows the user to navigate through a sequence of screens. A description or outline of an experiment in which students participate. Instructional materials that include the learning outcomes, activities, and assessment. A set of questions that aid in measuring student comprehension. Instructional materials that include back ground material and tips and will often include objectives, activities, worksheets, and answer keys. A resource that identifies the period or era of an event. Instructional information for use in reinforcing concepts. Instructional materials that include multiple lessons. Set of questions or instructions for a student. Can I access Education Resources from outside of Microsoft Office 365? Not at this time. Education Resources can only be accessed from OneNote Class Notebook and Microsoft Forms.